We hear the best feedback from teachers about this duet book! Almost all the scenes are gender neutral, so any combination of actor and actress can perform them. Directors also love that the dialogue is so natural that student actors learn their lines quickly. 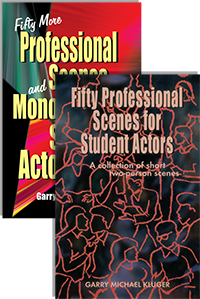 Performed in theatres, classes, and showcases, these duet scenes include some of the most-used original audition scenes from major TV networks and are ideal for students seeking roles in TV shows, commercials, and professional stage productions. Read more... Divided fairly evenly between comedy and drama, these scenes for two people are fun to perform even if sad, funny, poignant, and sometimes very dramatic. 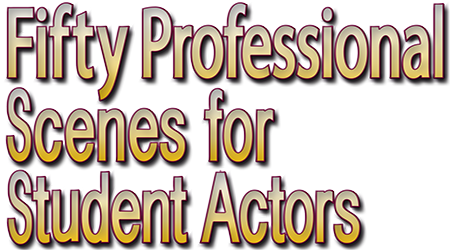 The success of Fifty Professional Scenes for Student Actors prompted this sequel of winning audition material — this time including monologues! The emphasis of these monologues and scenes is on believable characters, not caricatures. Designed for actors seeking roles in TV shows, commercials, and stage productions, both professionals and students who wish to work at a professional level will love the material. Actors have been using these same scenes to win roles at film and TV studios in New York, L.A., and Chicago. Students in acting classes have been using them to advance their acting experience and win roles in professional productions. This book is easy to use — comedies are separated from dramas and almost all the scenes are gender neutral, easily adaptable for use by male or female actors. SPECIAL OFFER! Buy both books for $24.00!